The BARS shellfishing basket mug will be treasured by any shellfishing enthusiast. 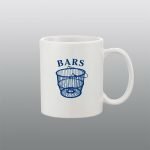 The logo is printed in dark blue on a white full size mug. Price includes shipping. You can also pick up one of these mugs at a BARS meeting or event for $5.00!